In a bid to save the endangered species, companies and private individuals have been invited to adopt a leopard as part of a WWF programme. 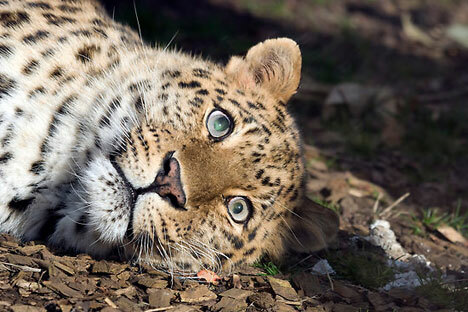 Companies have been invited to “adopt” one of 24 Amur leopards in the Land of Leopards National Park in 2013. The project will bring in additional funding for the preservation of these endangered predators, the head of the corporate partnership department of the World Wildlife Fund (WWF), Yekaterina Babina, told RIA Novosti. “We are estimating that ‘adopting’ a leopard will cost a company 600,000 roubles a year. Of course, a private individual can also adopt, but mainly we are counting on corporate partners. The company or the person will twice a year receive a report about what their sponsored leopard is doing. Also there will be different opportunities for companies – it can be a trip to the Land of Leopards Park, Leopard Days for the company’s employees and clients, there are a lot of possibilities,” she said. Twenty-four leopards out of 40 that the activists “know by face” thanks to photographs taken with photo traps, are ready for “adoption” and have been given names. “Now we recognise by face more than half of the Amur leopards that live on Earth now. It turned out that they are all different, with different personalities and habits. But a lot of routine expenditure is needed to do the holy deed of saving the leopards: vehicles, spare parts, fuel, navigators,” WWF deputy head of the Amur branch Vasily Solkin said. The Land of Leopards National Park was created in Primorye in 2012 to protect the Far Eastern leopard and Amur tiger population in the region. It consists of the Kedrovy Pad (Cedar Vale) Natural Reserve and the Leopardovy Wildlife Sanctuary, with a total area of 261,000 hectares. The Amur leopard is the northernmost subspecies of leopards. It has long, thick fur and is one of the rarest and most striking felines in the world. The Amur leopard was included in the Russian and international lists of endangered species. Over the last 20 years, their area of habitat in Russia was almost halved, and their numbers fell to about 40. There are no more than 10 Amur leopards in China, and there is no information on their numbers in Korea.